I have not done a "Weekend Project" in a while. I saw this idea on the net somewhere. More than likely on Pinterest. My friend Terri came to mind when I saw it. I wanted to make one for her SO badly. I happened to have a pack of the large Stampin' Up! cases on hand. SO, with that in mind, I decided I needed one too! What you need to make this is the large wood block case. A door/drawer handle. Decorative paper and any stamp set you wish to use. 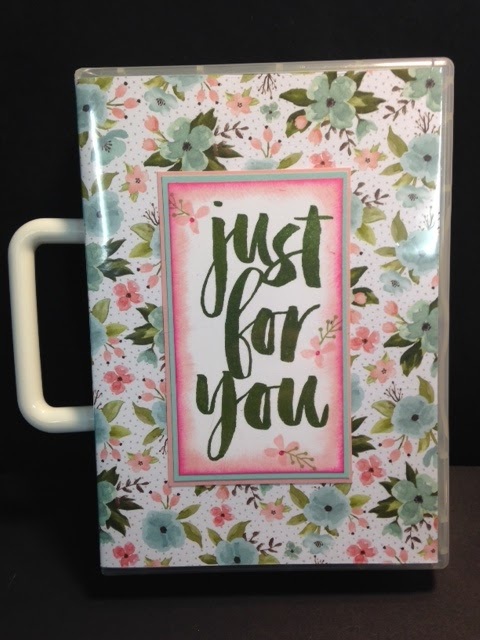 Here I used the "Just for You" Sale-a-Bration set. Now when I was reading on how someone had made their case, they had their hubby drill holes in the case. Well, I didn't want to bother my hubby to drill some holes. I didn't want to drill the holes either. So what I did was I took a large sewing needle, I lit a candle and then I heated up the needle. Before I did all of this, I had the case marked where the holes need to go. Next I put the needle in the flame and heated it up. I poked it into the marked hole and it melted a nice hole in the case. The screws are pointed and screwed into the holes I made nicely. You just need a starter hole or your plastic case will crack. The screws that come with the handles are way too long. They are meant for cupboards and or drawers so they go through a thick piece of wood. These cases are not thick at all. I read that the gal had her hubby cut off the screws. That is not an easy task, screws are made of pretty hard metal. I thought about getting my Dremmel out and putting on the cutting disk but It didn't sound like something I wanted to do. I'd never done it before and wasn't sure how good I would be at it. SO, I went to the local Ace Hardware store and a nice sales person helped me find what I needed. I told him I needed some screws that were like the ones in the package but very short, near or under 1". The color didn't matter, which made the task easier for the guy to find them. The were $.27 each. I didn't think it was out of line, it was what I needed. SO I got my 4 screws and went home to work on my totes. I had bought my handles at Lowe's for $1.47 each. Not a bad deal there either. They are white plastic. For this tote I used some decorative paper from the "Birthday Bouquet" paper pack. I used a different design from that same pack for my tote. I liked just the look of the paper as the design but I really wanted to add something more. SO I got out the "Just for You" set and stamped the words using Mossy Meadow. I added a few Blushing Bride flowers. I used the tip of a Crazy Glue bottle and Melon Mambo for the flower centers. I used Pear Pizzazz ink for the little bud leaf things! I sponged the edges using Blushing Bride ink and then sponged the very edge using Melon Mambo. I layered the word using Pool Party and then Blushing Bride card stock. I think it turned out great! I filled it with a few fun things for Terri and gave it to her last night!! I wish I had more cases, more handles, and more screws so I could make a bunch of these to be more organized with my "stuff"! I think I will be getting more cases when I order again. In the meantime I will be getting some handles and screws so I'm ready!!! I think they would look great on a shelf. Just grab and go. 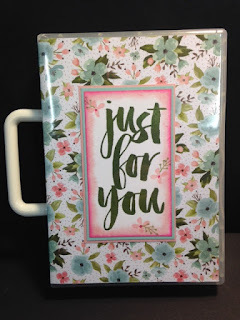 In my tote I put my stamping supplies. Scissors, tape runner, Dimensionals, Glue Dots, a pencil and an eraser. I'm good to go!! Now I can't wait to use it! Have fun with these!! Imagine how organized you can be with these totes lined up on your shelf!! !